The Most Trusted Service to Preserve the Memory Of Your Child's Special Day. Our world class SystemK4 cleaning technology restored and protects your gown. Your gown receives a meticulous museum quality cleaning utilizing our exclusive SYSTEMK4 delicate fabric cleaning technology. The last step protects your fabric from future yellowing and will also help protect your gown if is worn again. Your gown and up to 3 additional accessories are then carefully placed on a preservation bust and packaged into your preservation chest. 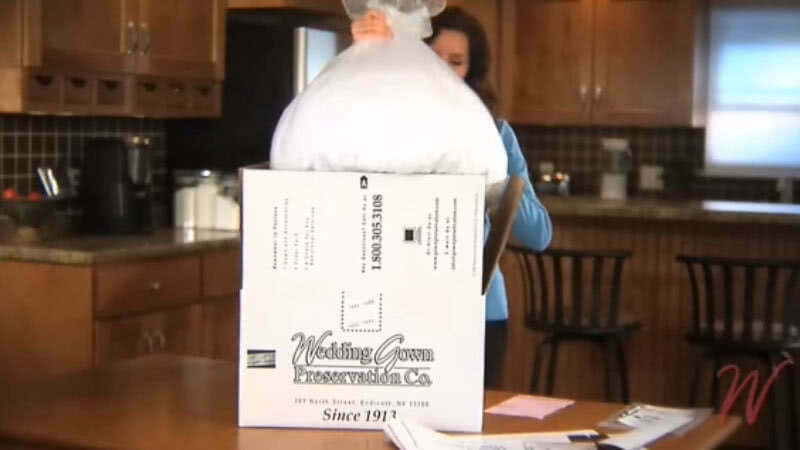 Your gown is safely and securely shipped back to your home with a 100 year LifeTime+ certificate of guarantee against future yellowing or staining. You get the peace-of-mind in knowing your child's christening gown has become a treasured family heirloom to be enjoyed by future generations. Your order includes 2-way shipping of your child's christening gown to our preservation studio where it is perfectly preserved and safely back to your home. Nervous about sending in your child's christening gown? Don’t be. We provide $500 worth of insurance, so you can rest easy while knowing your gown is being treated like royalty. Our world class cleaning technology removes both visible and invisible stains from your wedding day and protects your child's christening gown against future yellowing. Our white embossed preservation chest has been newly improved to display more of your gown and protect your child's christening gown from the elements. We’ve sourced only the best and beautiful acid free tissue paper and preservation bust to ensure your child's christening gown remains perfectly preserved in our preservation chest. After you order, you’ll get access to GownTracker™ providing you with status updates as your christening gown is received, cleaned & preserved and delivered back to your home. Is my child's christening gown safe during shipping? We've taken every step available to make sure your child's christening gown is safe and secure as it is shipped to our facility and back to your home. The finished kit requires a signature from a resident of your home and each kit comes with shipping insurance included to keep your mind at ease. For as long as we've been the #1 online retailer of the Wedding Gown Preservation Kit, we've never had a gown lost in transit. Over 3,000,000 brides can attest to the safety of our time-proven process while saving hundreds of dollars at the same time. Will my child's christening gown fit in the preservation chest? Yes, there are three different sizes of boxes ranging from small to extra large which will accomodate any size christening gown. The 100 year warranty protects your gown against future yellowing for 100 years. In the event that you feel your child's christening gown has yellowed, the Wedding Gown Preservation Company will re-clean and preserve your gown at no cost to you. The absolute best time to order your Preservation Kit is when (or soon after) you purchase your child's christening gown. Ordering your kit early is the best way to ensure this important item is checked off your wedding "to-do" list and the best way to treat yourself to a stress free day without having to worry about dirt, grass, food, or sweat stains that will inevitably occur during your reception. Your kit never expire so it doesn't matter if you order your preservation kit one month before your wedding day, or one year. 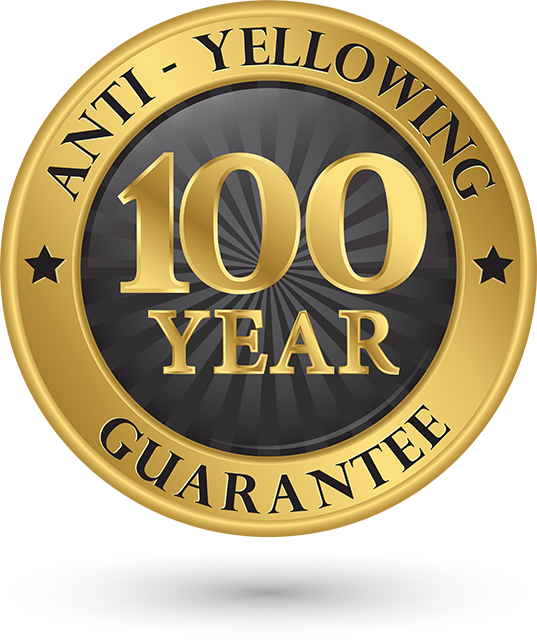 While other companies only offer a lifetime gurantee on their preservations, we go beyond the industry standard to offer our customers a 100 year guarantee against yellowing. 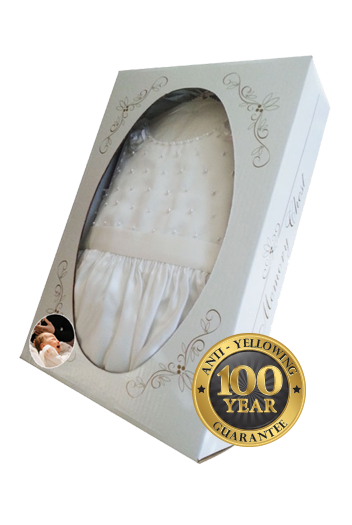 As the oldest christening gown preservation company in the nation, our service will be there to back up our guarantee. That's our promise to our customers. Choose to add a photo to your preservation box if you'd like to show your friends and family what your gown looked like when you wore it on your wedding day. You can choose any wedding photo from your wedding day but we recommend a photo of you alone in the christening gown or with you and your partner so the details of your gown can be seen.